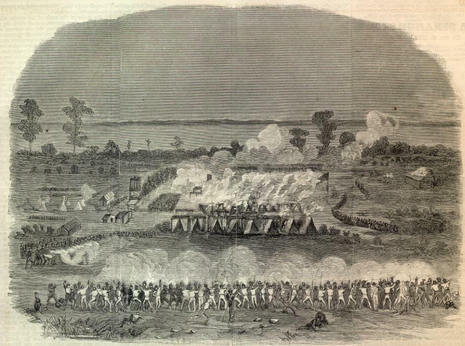 The Battle of Santa Rosa Island (October 9, 1861) was an unsuccessful Confederate attempt to take Union held Fort Pickens on Santa Rosa Island, Florida. Santa Rosa Island is a 40-mile barrier island located in the U.S. state of Florida, thirty miles from the Alabama state border. 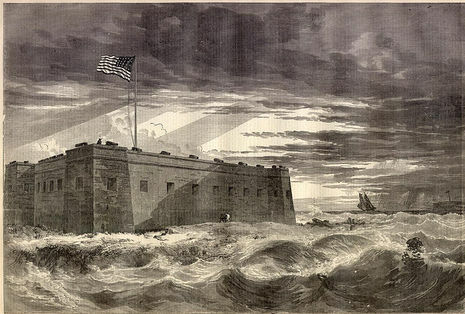 At the western end stood Fort Pickens, which in the fall of 1861 was gar risoned by parts of the 1st, 2nd, 4th and 5th U. S. artillery and the 3rd U.S. Infantry, under command of Col. Harvey Brown, of the 5th artillery. The 6th New York Volunteer Infantry, commanded by Col. William Wilson, was encamped outside of and a short distance east of the fort. After midnight on October 9, Brig. Gen. Richard Anderson crossed from the mainland to Santa Rosa Island with 1,200 men in two small steamers to surprise Union camps and capture Fort Pickens. He landed on the north beach about four miles east of Fort Pickens and divided his command into three columns. After proceeding about three miles, the Confederates surprised the 6th Regiment, New York Volunteers, in its camp and routed the regiment. Gen. Anderson then adopted a defensive stance to entice the Federals to leave the fort and attack. Receiving reinforcements, Col. Harvey Brown sallied against the Confederates, who reembarked and returned to the mainland. The Union loss was 14 killed, 29 wounded and 24 captured or missing. General Braxton Bragg, commanding the Confederate forces at Pensacola, reported their loss as "30 or 40 killed and wounded," but a Confederate newspaper, found by Lieut. Seeley a few days after the occurrence, gave the total casualties as 175. Maj. Vodges, of the 1st artillery, was captured, and on the Confederate side Gen. Anderson was severely wounded. The camp of the 6th N. Y. was partially destroyed. Fort Pickens and the battle site are preserved within the Gulf Islands National Seashore. 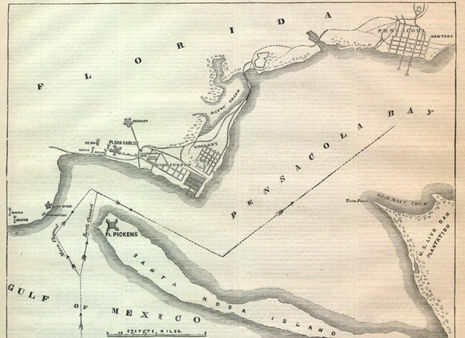 When Florida seceded from the Union on January 10, 1861, the new Confederacy viewed Pensacola’s naval shipyard and railroad link as invaluable assets to the Southern cause. On January 12, Florida and Alabama state troops, along with many local citizens, forced U.S. Commodore James Armstrong to surrender the naval shipyard. In the bargain, the Southerners also acquired a million-dollar dry dock, workshops, warehouses, barracks, a hospital, 175 cannons, projectiles and ordnance stores.